Look at your iPhone. No, ignore that text message. Open your music app. Search for U2. You already own this album. It is impossible to separate U2’s album from the eccentric way the band released it to the world. 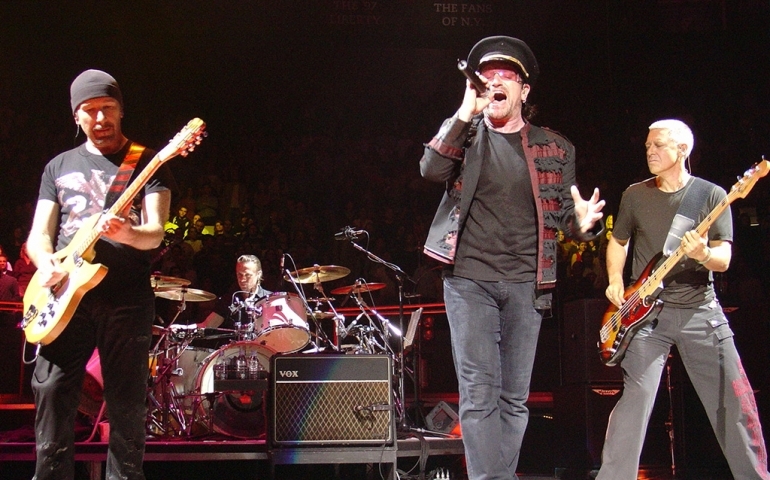 On September 9th, U2 performed at Apple’s product launch event. Directly after playing, Apple CEO Tim Cook announced a brand new album from the band that would be free for every iTunes user. Many iPhone users opened their music app to find the album already on their device, simply waiting to be listened to. This caused a mass outcry from Apple users who felt violated. “What else can Apple put on my iPhone? Can they take stuff off they don’t like?” Many users have searched for ways to remove the album from their devices. Because of this backlash, Apple has created a link that will let users remove the album from their iTunes account. However, before we all go back to forgetting the band our parents jammed to, I believe it is important to explore the artistic and creative endeavor that U2 has created, odd release aside. Over the years, U2 has developed a predictable style that has made album after album sound predictable and flat. However, Songs Of Innocence sees the thirty eight year-old band looking back to where they came from. Everything about this album, even its minimalistic album artwork, yearns for a time when music was simpler and artists didn’t have to worry about writing songs that people could relate to. The set’s opening track, The Miracle (Of Joey Ramone), is a eulogy to the New York punk scene of the 1970s, while Iris is a deeply emotional and raw tribute to Bono’s mother. Band members have admitted that they are on the “verge of irrelevance”. After all, U2 no longer tops sales charts, and their last album was quickly forgotten by the media. This understanding is one of the things that makes Songs Of Innocence so great. The band could have just rested on their laurels and made another traditional “U2” album, but instead they decided to step back and do some serious introspection. This isn’t to say that Songs Of Innocence is a perfect record. Because each track is paying homage to a different part of U2’s influences, the album as a whole comes off as disjointed. The tracks simply do not flow well together. Every style that the band tries simply does not have room to breathe in the confines of a single track. Despite it’s shortcomings, Songs Of Innocence invites listeners into a raw and emotional rollercoaster of emotions for a wonderfully discounted price.